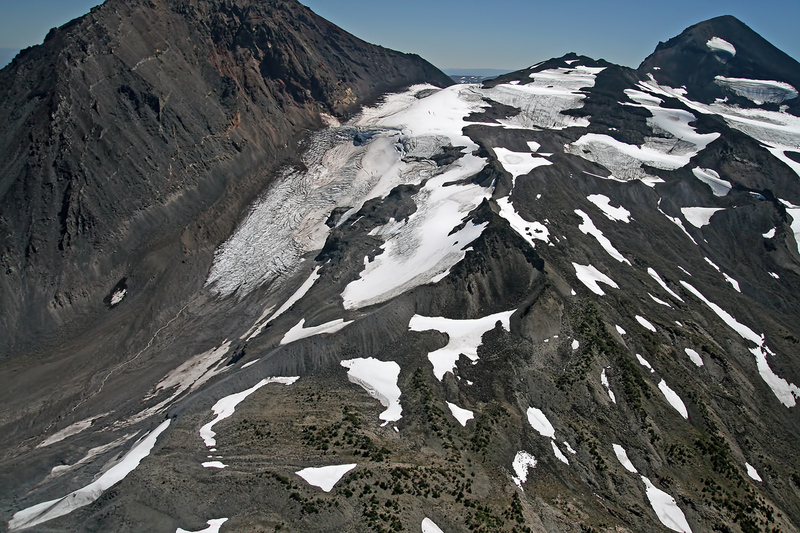 The Collier Glacier sits on the west side of the North Sister in the Three Sisters Wilderness. 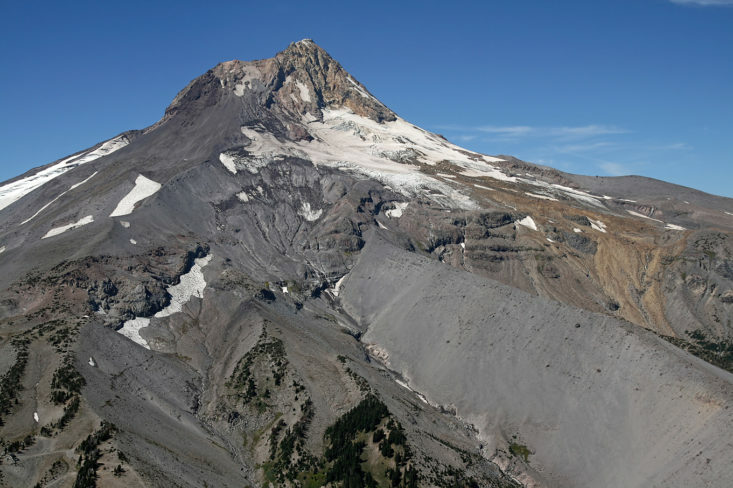 It was once thought to be the largest glacier in Oregon, but has suffered significant retreat in the 20th century (as documented by the website Glaciers of the American West). The Collier heads just below Prouty Saddle between the Middle and North Sisters at an elevation of 9200 feet, and has cut a deep gouge into the western flank of the North Sister. The glacier used extend to Collier Cone (which blocked it’s flow and resulted in a deep, thick glacier) at an elevation of 6975 feet, but has since receded several hundred feet higher on the mountain. 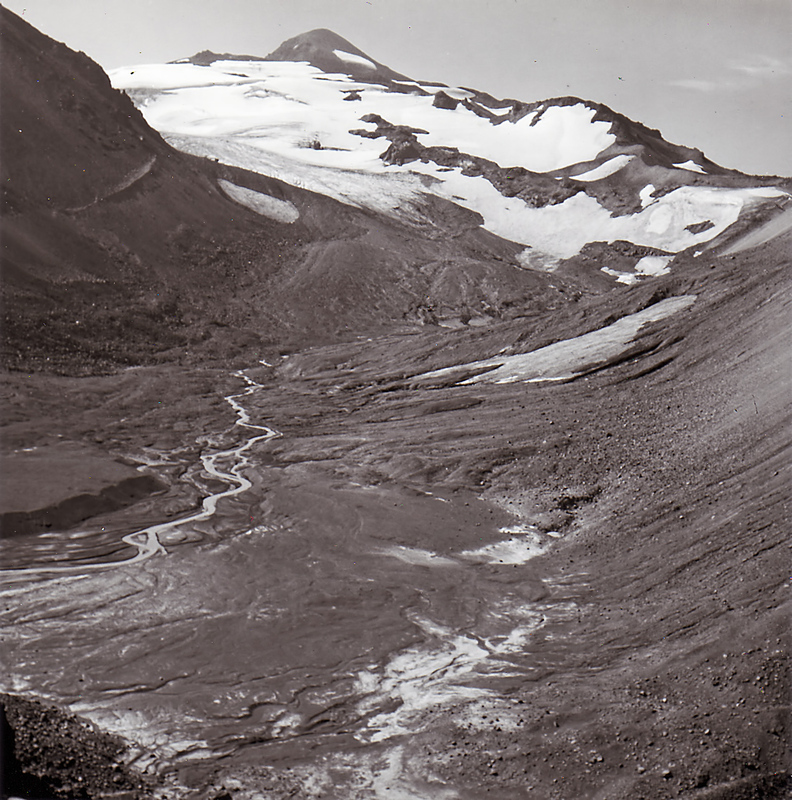 The Collier Glacier is one of the more photographed and studied glaciers in the Oregon Cascades, and many older photos of the glacier exist. Of those, a series of photographs taken by photographer R.H. Keen and provided courtesy of Jim O’Conner of the USGS, are of particular interest. R.H. 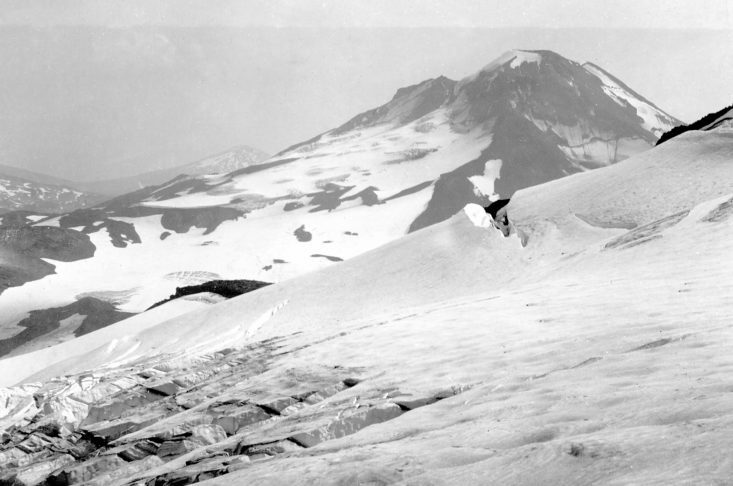 Keen shot a series of photos over several years from the 1930’s thru the 1970’s from the same vantage point at Collier Glacier View. The photos document the changes in the glacier during that time period and are quite profound. 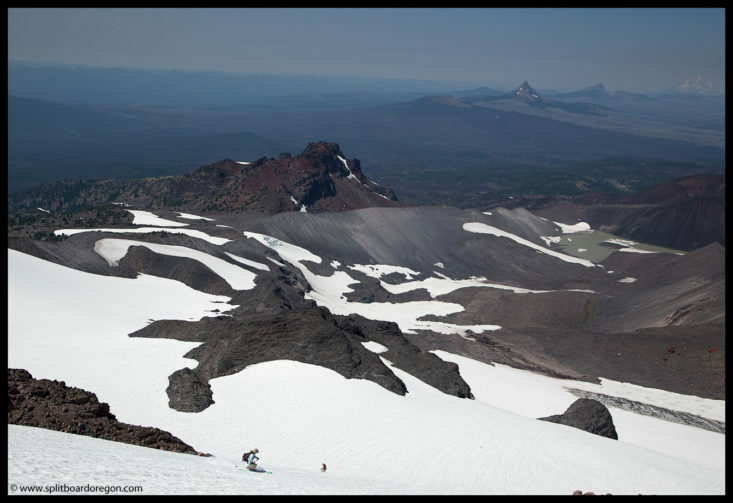 Although fairly remote and challenging to access, the Collier affords access to some of the more scenic terrain for turns in the Oregon Cascades. 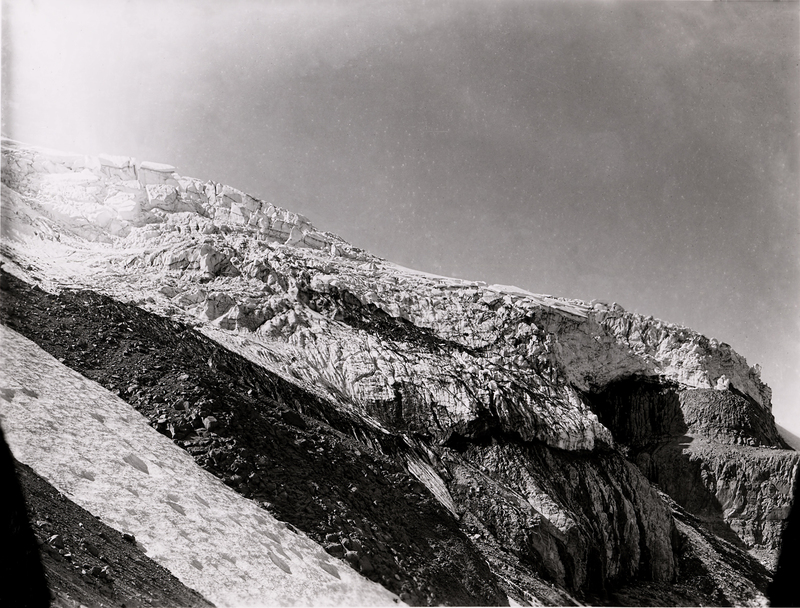 Although the glacier is much receded and not as heavily crevassed as it used to be, don’t be lulled into a sense of complacency — crevasses still posed a hazard on the glacier and caution is advised when traveling or skiing on it! 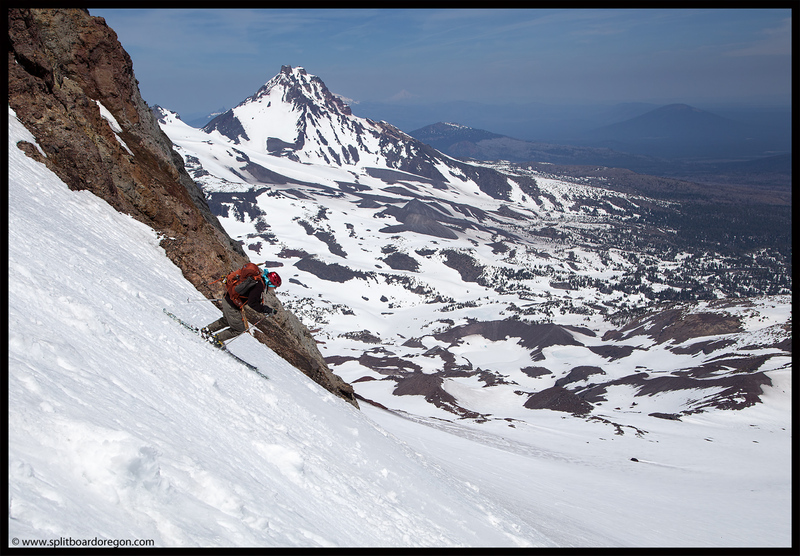 There’s no doubt the Collier Glacier is Oregon’s most unique and special glaciers, and a fun place to make turns as well. 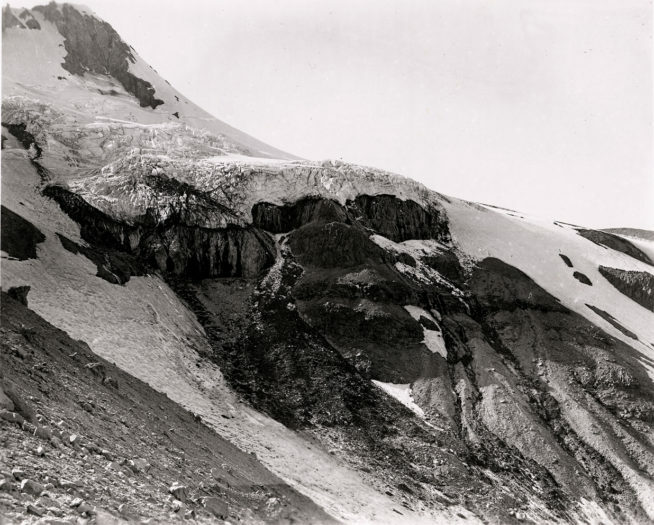 The Newton Clark Glacier sits on the east side of Mt Hood and is one of the larger glaciers on the mountain. It is a fun place to score turns well into the spring, and the headwall is an extra special treat. The starting elevation of the glacier as shown on the topo maps is around 10,400 feet, although photographic images from the past few years indicate that the headwall has or nearly has melted out and the actual glacier now starts around 9500 feet. The terminus elevation is in the vicinity of 7500 feet. 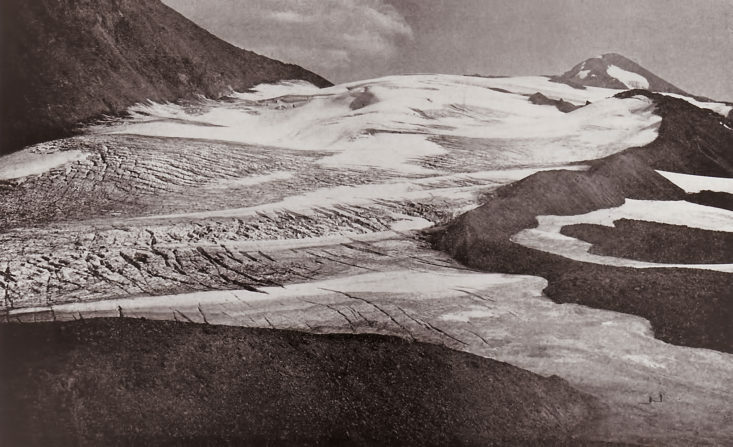 The glacier has lost a substantial amount of volume, especially near the terminus and the icefall, which is evident when looking at photographs from the turn of the century. The photos below were taken in July of 1901 by Harry Felding Reid. The photo below, courtesy of John Scurlock, was taken in August of 2007. Note the cliffs in the lower left of the photo are completely devoid of ice, as opposed to the photos above. The Newton Clark has an interesting history with respect to skiing, with a notable and well documented first descent by the famous skier Sylvain Saudan in 1971. It is a steep, worthy line, but deserves respect. 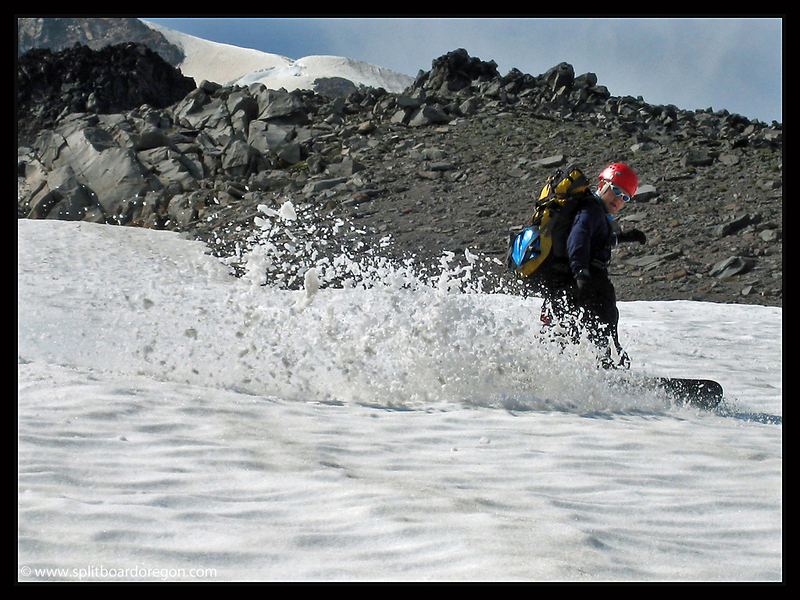 Objective hazards include significant avalanche danger, crevasse falls, rockfall and exposure. 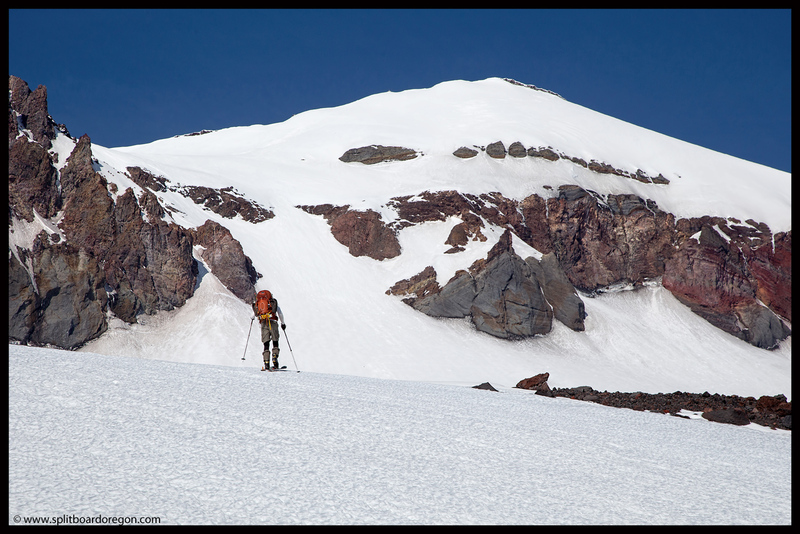 When conditions are right however, it is one of the better lines on Mt Hood and definitely worth the effort. 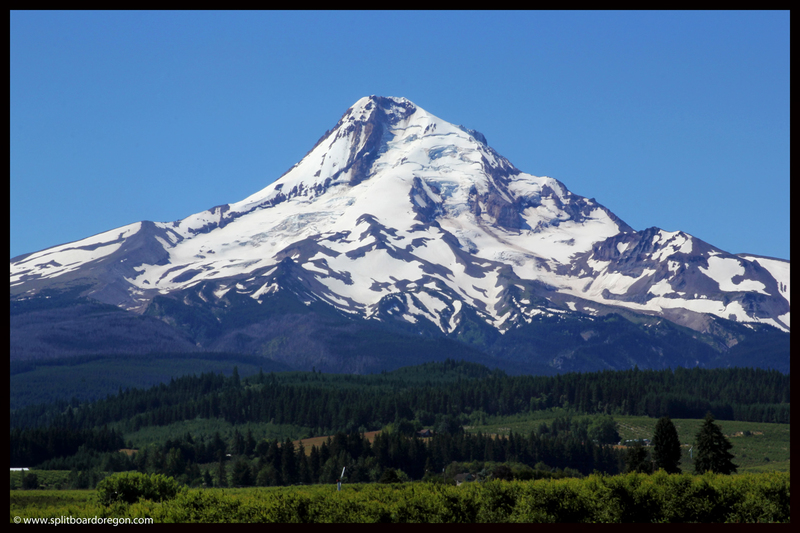 The Prouty Glacier, located on the northeast side of the South Sister, is the mountain’s largest glacier. The Prouty occupies an elevation between 8,500 to 9,500 feet, and heads forks of both Squaw Creek and Park Creek. Meltwater from the glacier also fills Carver lake. The below picture, courtesy of John Scurlock, was taken on August 28, 2007. Like most of the cascade glaciers, the Prouty is in retreat. Historical photos from the turn of the century show a glacier with much more volume and mass than the glacier that exists today. The below photos offer a bit of a comparison, although not taken from exactly the same spot. The first photo, taken by I.C. Russell and courtesy of the US Geological Survey, was taken in 1903 from the Diller Glacier on the Middle Sister. 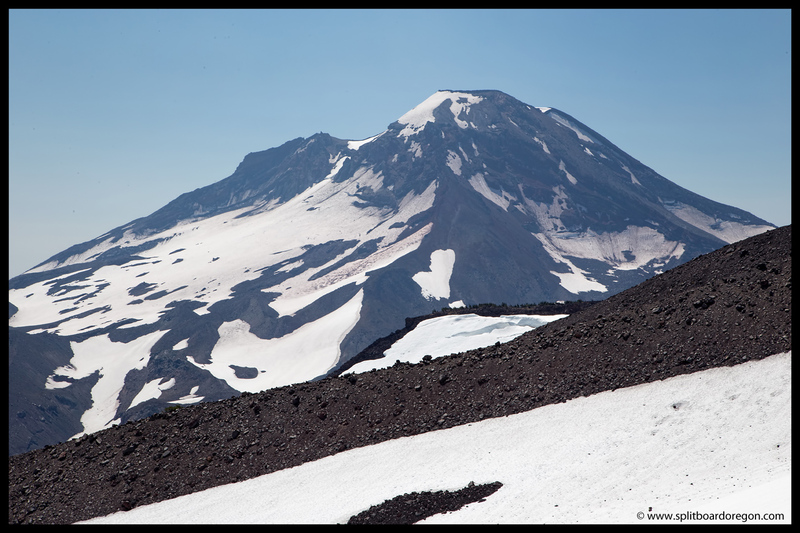 The second photo, taken on July 31, 2017 from the Hayden Glacier on Middle Sister, shows much less glacial mass and much more exposed bedrock. Touring on the Prouty affords access to some nice terrain for turns, but does require a bit of effort to get to the glacier. Like any glacial travel, touring requires caution, as objective hazards such as a crevasses and bergschrunds still exist. Rockfall is also a concern. Spring and early summer turns on the Prouty glacier can be excellent. 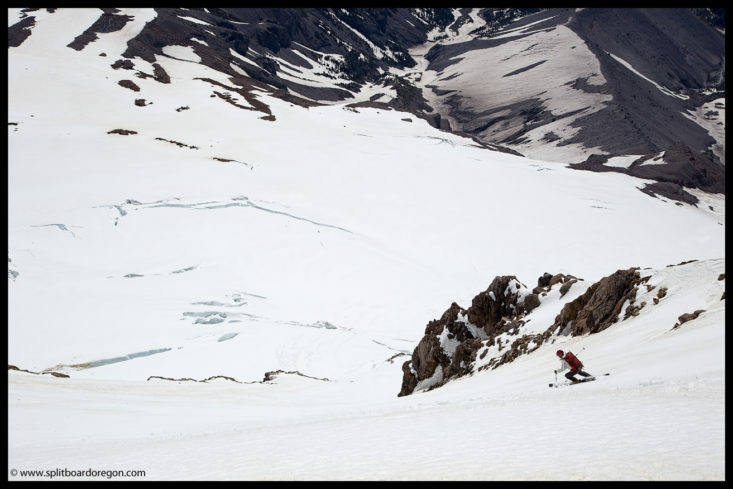 If you’re feeling up for a spicy descent, you can combine turns on the glacier with turns off the summit via a steep chute through the glacier’s headwall. Bottom line — a trip to the Prouty is committing, but worth the effort. 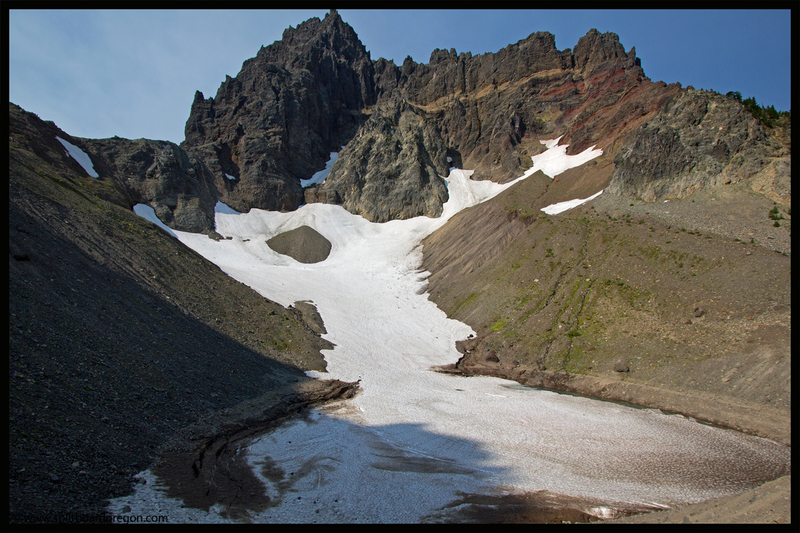 Located on the northeast side of Three Fingered Jack, Jack Glacier is no longer labeled on USGS topographic maps and is generally considered a permanent snowfield rather than an active glacier. 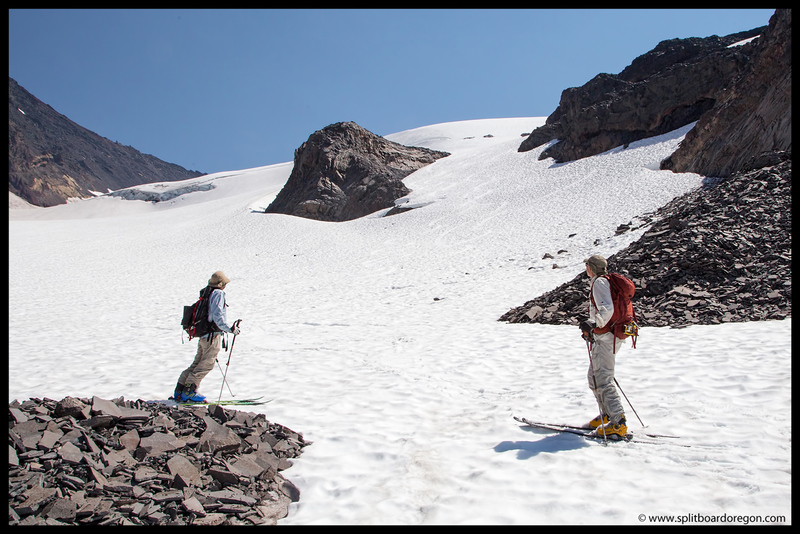 It’s elevation is unusually low for a permanent snowfield in the Oregon cascades, a direct result of the very little sunlight it receives due to it’s well protected location on the mountain’s northeast cirque. 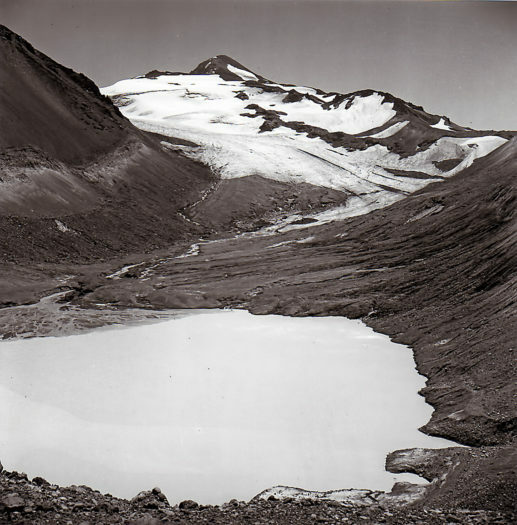 Ranging in approximate elevation from 6100-6400 feet, evidence of recent glacial activity exists in the cirque occupied by Jack Glacier, including a large terminal moraine at the bottom of the bowl which holds back meltwater and creates a seasonal lake. 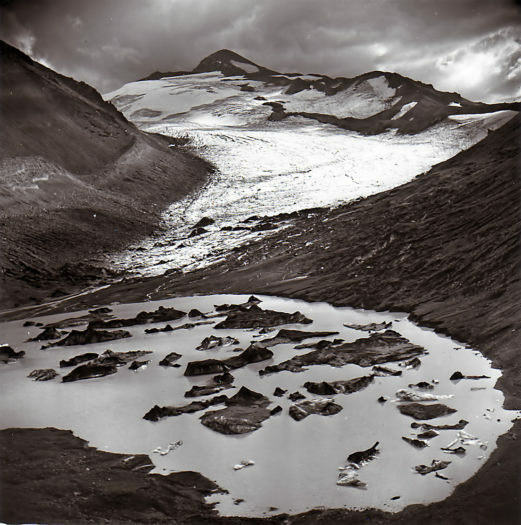 The photo below, taken in late August 2012, shows the Jack Glacier as it exists today. 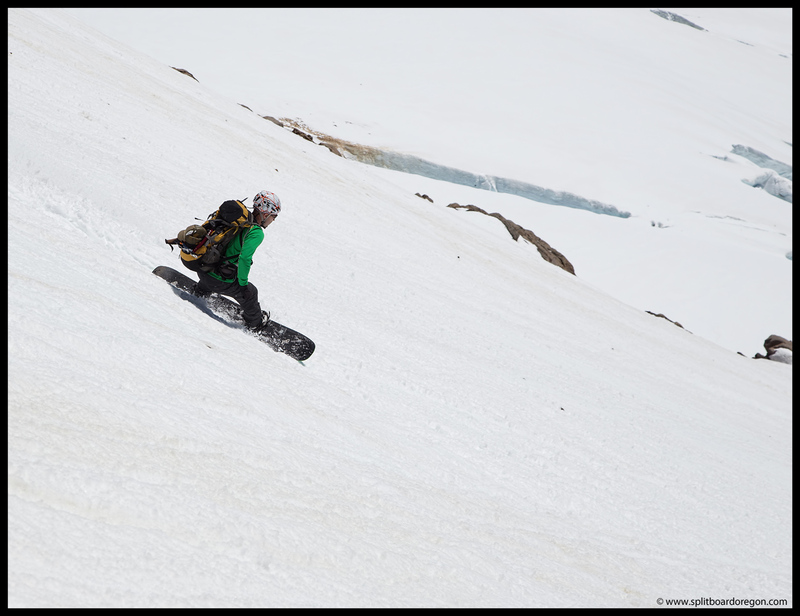 Decent turns can be made on the snowfield, though for many it’s hard to justify the hike in for the minimal amount of vertical available. 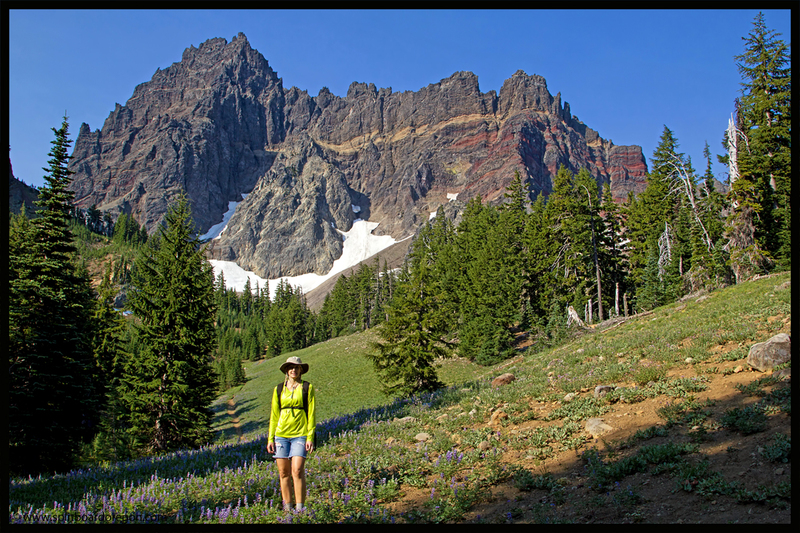 However, the area around the glacier itself, including the wildflowers of Canyon Creek Meadows, more than justifies a summer hike into what many consider to be one of the more scenic places in the Oregon cascades. 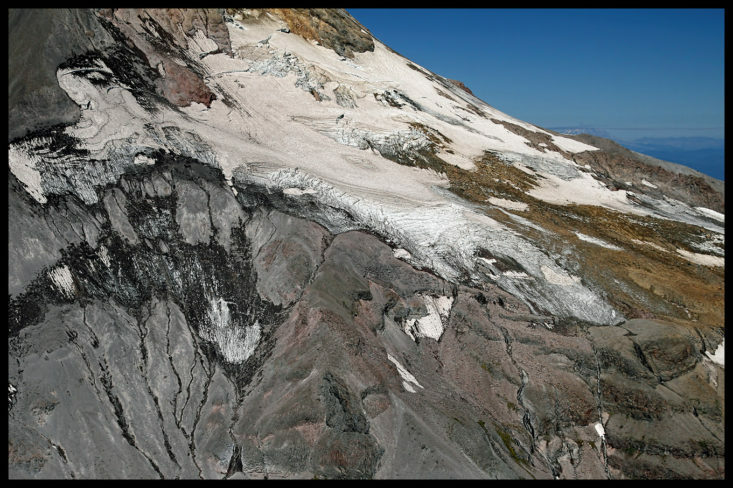 One of the smaller glaciers on Mt Hood, the Langille Glacier is located west of the Langille Cliffs on the mountain’s north side, and below and between the Eliot and Coe glaciers. Named after the Langille family who managed Cloud Cap Inn from 1891 – 1907 and guided early climbers on the mountain’s north side routes, the glacier ranges in elevation from approximately 6500 to 7500 feet. Considered to be inactive, the Langille is basically a large snowfield that has been in retreat since the turn of the century. 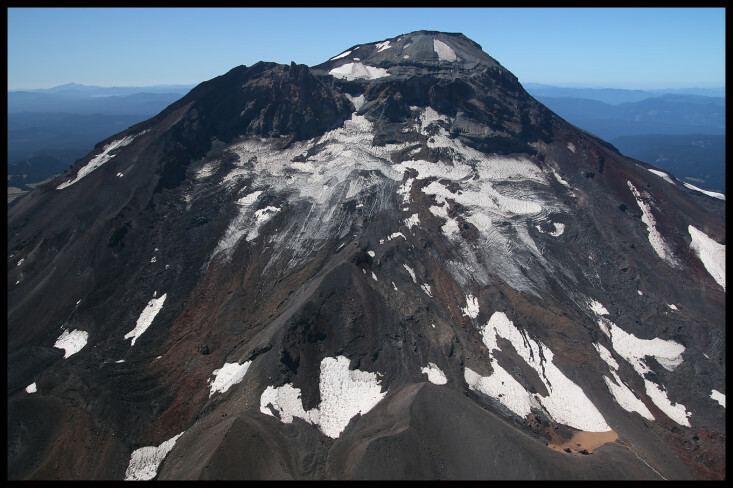 The photo below, taken in early August of 2011, shows the Langille, located just above timberline and in a direct line below Mt Hood’s summit. The Langille is part of a larger complex of terrain commonly referred to as the Langille bowls by backcountry skiers and boarders, offers excellent spring and summer turns. When combined with a trip to the Snowdome, total vertical can exceed 3000 feet. Access however, is somewhat of a challenge, given that the Timberline trail washed out a number of years ago and now requires a trek across the lower Eliot Glacier to reach the area and a subsequent hike back up to the base of the Eliot for an exit. 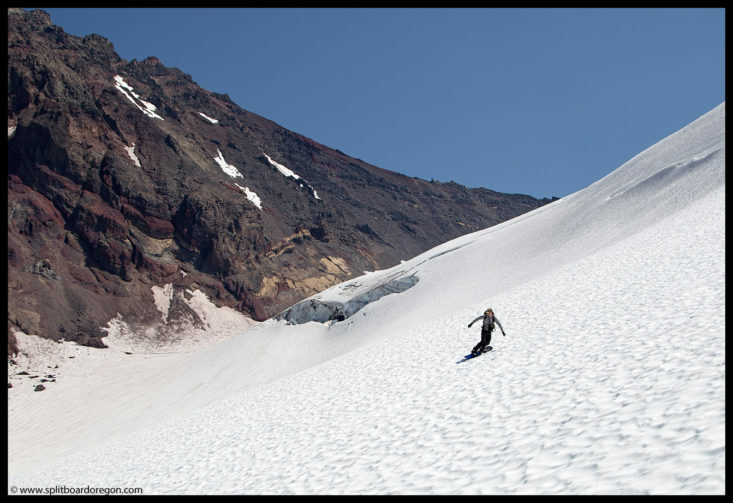 One of the prettier areas on Mt Hood’s north side, a trip to the Langille Glacier offers exceptionally scenic views of the mountain with a feeling of remoteness, and is definitely worth the effort required for the turns.